Kaleidoscope stamping is a technique for recycling your stamps into new images. What will your stamp look like? Well, look through a kaleidoscope, turn it, and the image changes again and again. Now you can make stamps look like that! You create dozens of DIFFERENT images with your rubber stamp. The results will always be surprising and sometimes people won't even be able to tell what the original image was! Results are very complex, beautiful, detailed, and excellent for hand coloring but look stunning even in black and white! And the techniques are simple! 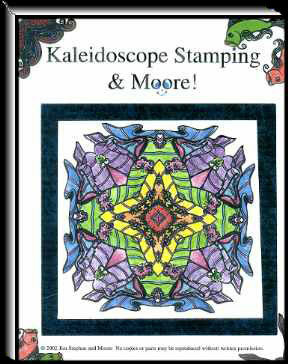 Kaleidoscope stamping is not difficult. Dani Moore emailed me the text and directions without illustrations. I created the step by step illustrations reading the instructions. If I can do it without pictures imagine what you can do with pages and pages of illustrations, ideas, suggestions and color hand tipped in illustrations. "Kaleidoscope stamping & Moore" (that's a pun too--Dani's name is Moore) will give you instructions on how to make a real kaleidoscope out of a Pringles can along with 4 different methods for creating these complex beautiful images so you do get more. You can buy the book with the stamps used to create the illustrations (25 large, unmounted stamps, the templates and the book for $49.99. Book & templates alone cost $19.99. Shipping is at cost charged to credit card. CA sales tax is 7.25%. Writing a check? The book/package alone weighs over 1 pound BEFORE I put it in a box so I'll need to know your zip code to calculate shipping at cost. Outside USA shipping is at cost charged to Master Card, Visa, JBC or American Express. PS: This book was introduced at the Mesa, AZ and Carson, CA stamp conventions in November 2002. One of the first books sold was to a HIA CPD, CCD and CPT instructor. You can bet you'll be seeing this technique demo'ed around the country. Dani will travel and teach and I will teach it too. And if I can teach it, you bet you can do it too! Why wait? Get the book NOW!